Tomi Lahren reached peak notoriety with her out-spoken, conservative views throughout the Presidential election. The South-Dakotan 24-year-old has reaped the benefits of media attention with her extremely controversial political beliefs on the Black Lives Matter campaign and immigration, as well as President-elect, Donald Trump. She now has a huge social media following and is a favourite political commentator of FOX News. But with fame comes the internet detectives, in their hoards, and with internet detectives comes some embarrassing tweets from your past. It seems that before Tomi was an opinionated debater who tried to take on Trevor Noah, she was more motivated by partying – at none other than Las Vegas University – than politics. Tomi, like many young adults who struggle with boundaries, regularly tweeted details of her personal life to her friends and followers. She was not afraid to call out people who wronged her or got on her nerves… So not much has changed at all. 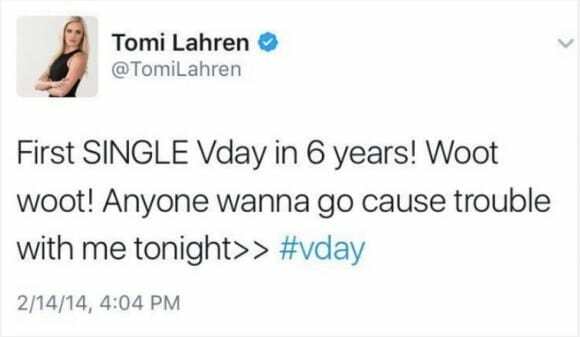 Unfortunately for Tomi, it transpires she hasn’t always been the diligent patriot she claims to be. Like many of us, as teenagers she found the prospect of hard work and propping up the country’s economy with good, honest labour a bit of a drag. However, Tomi seems totally unphased by the leaks. Sounds like I’m a pretty fun chick. Keep scrolling. This is probably the most sensible tweet Tomi has ever sent into the Twittersphere. Far be it for us to judge the – perfectly legal and acceptable – behaviour of a young woman enjoying life. Let’s not let these tweets distract from the hate-filled content Lahren likes to peddle on social media now she’s allegedly a mature, sensible adult going about her business in global politics.